It is a story lectured to eager young students since time immemorial or since John Dixon Hunt began teaching (or whichever one is closest to the truth): when Louis XIV treated VIPs to a tour of his gardens at Versailles, the route they took was carefully choreographed, with a predetermined order of strolls, stops and contemplation, not unlike perhaps a self-guided, podcast-narrated educational garden tour, which you can do at Millennium Park Chicago. But the cause for enlightenment had nothing to do with the program. Emperors and kings have long understood that any display of water control can give much needed political and social capital to their persons and rule. Who else would have had the resources to channel water far away from its source, almost always in defiance of gravity, and then to make it dance, fly, ripple, and even whistle a merry tune? Only the powerful and wealthy, of course. To put it in another way, fountains are perfect propaganda. Unfortunately, Versailles was situated on a flat plain. To create the needed hydraulic pressure, water is typically outsourced from high elevations; gravity would then most of the work. So what alternative did they use? Engineering. But still, the complex system of pumps, aqueducts, underground tunnels and pipe distribution was not enough at times. Hence the choreography: not all fountains in the gardens were turned on, just the ones where the royal coterie happens to be. I was reminded of this when reading about Datafountain, a fountain in which currency fluctuations determine in realtime the height of the water and noise level. In effect, the frenetic pace and information overload of global capitalism get filtered and translated into a quiet, bubbling spring. 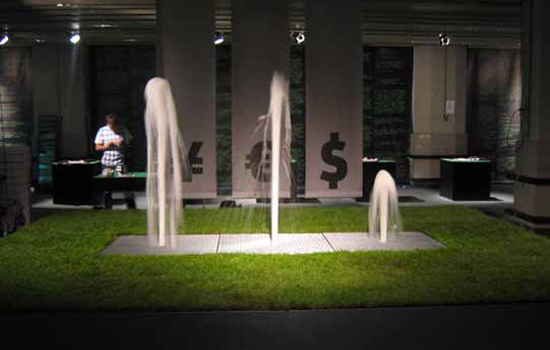 Or not: when markets are their usual volatile selves, the fountain would be quite active both visually and aurally. Curiously, it would probably be at its calmest when the yen, pound, and dollar plummet and become worthless. A world-ending catastrophe can do that. Of course, less benign events can be plugged-in as well: the daily casualty rates in Iraq and Afghanistan; the number of squatter houses bulldozed by African despots; the daily global death rates from AIDS (a fountain for each continent, perhaps). The possibilities are endless. When we see a fountain in public space, we always wonder what its spraying pattern tells us. It is our future goal to design more contextual datafountains and also to re-think existing fountains as information displays. Perhaps in the future, it will be considered rude to place a fountain in public space that has nothing to say. The information displayed on the fountain will become part of a discussion about the design of public space. The context plays an important role in the communicational value; a fountain in front of a metro station will probably means something different than a fountain in front of a stock exchange.